Sean and Dorothy Fitzhenry’s homebred Dixie Moon who, in June, held off the heralded Wonder Gadot to capture the Woodbine Oaks, presented by Budweiser, will attempt to pick up a second Canadian classic victory in Sunday’s $225,000 Wonder Where Stakes, at Woodbine. 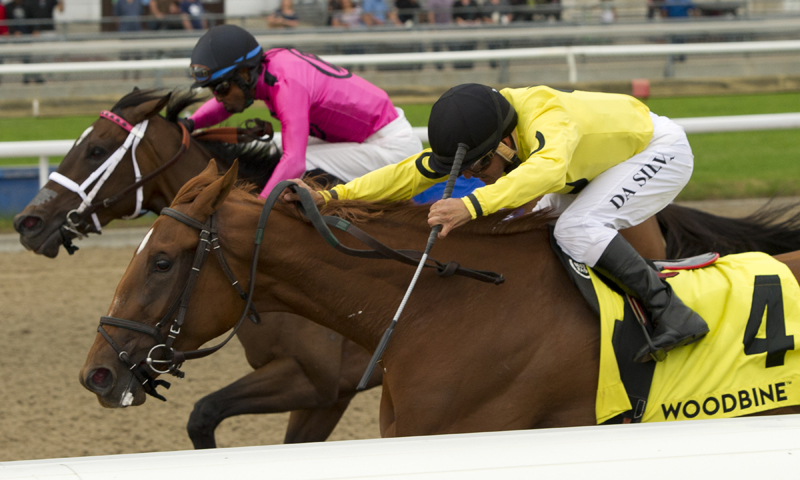 Trained by Catherine Day Phillips and piloted by Eurico Rosa da Silva, Dixie Moon used a prominent approach to win the Woodbine Oaks, first leg of the filly Triple Tiara, digging in gamely down the lane to repel the advancing Wonder Gadot. The two fillies renewed their rivalry in The Queen’s Plate, but it wasn’t Dixie Moon’s day as the Curlin chestnut was eased while Wonder Gadot romped to a famous score. Dixie Moon won three of five starts as a two-year-old with her only losses coming in Grade 1 events when second in the grassy Natalma Stakes (a head in front of Wonder Gadot) and sixth in the Breeders’ Cup Juvenile Fillies Turf. While Dixie Moon failed to respond over yielding turf in her sophomore debut in the Grade 2 Appalachian at Keeneland, the versatile filly rallied strongly to be second, defeated just a neck to Miss Mo Mentum, in the Grade 3 Selene Stakes which set up her game Oaks score. Day Phillips believes the Queen’s Plate effort was an anomaly and notes that the chestnut is in good order ahead of her return to action. “A combination of three weeks (between the Oaks and Queen’s Plate) isn’t that much time when you ran as hard as she did in the Oaks and it was very, very hot on Plate day. A few factors came together and created a perfect storm that wasn’t good for Dixie Moon. She’s had a bit of a break and she’s certainly doing well, eating well and very happy now,” said Day Phillips. With Wonder Gadot pointed to the Grade 1 Travers Stakes at Saratoga on August 25, Dixie Moon will not have to face her familiar foe on Sunday. “She’s two for three (against Wonder Gadot) but Wonder Gadot is obviously a tremendous filly. It’s unbelievable what she’s gone on to do. Maybe we’ll have a rematch somewhere down the road. You never know,” said Day Phillips. In the meantime, Day Phillips believes a return to the Woodbine turf should suit Dixie Moon. To win the Wonder Where, a 1 ¼-mile trip over the E.P. Taylor Turf Course, Dixie Moon will have to deal with fellow classic winner Safe to Say who won the second leg of the Triple Tiara, the Bison City Stakes, the day after the Queen’s Plate. Trained by Mark Casse for owners Gary Barber and Windways Farm, Safe to Say arrives at the Wonder Where from a fifth-place run in the Grade 3 Ontario Colleen Stakes. Jerome Lermyte will ride. Ivan Dalos’ homebred Avis’s Mineshaft, a dueling second in the Bison City when defeated just a neck, will be chasing her first added-money score. The Mineshaft-Avie’s Empire dark bay is often in the thick of it with a nose loss in the prestigious Princess Elizabeth and strong fourth-place runs in the Grade 3 Mazarine and Grade 3 Selene Stakes to her credit. Gary Boulanger retains the mount. Double Latte and Glamanation complete the five-horse field. The coming weekend is one that recalls a very happy memory for Day Phillips. On Saturday, a field of 11 will compete in the 36th edition of the Grade 1 Arlington Million, a race that Day Phillips captured in 2007 with Canadian-bred Jambalaya. The now 16-year-old Jambalaya is enjoying life with another famous friend, Canada’s 2005 Horse of the Year, at the conditioner’s Kingfield Farm. The Wonder Where is slated as Race 9 on Sunday’s card with the $125,000 Seagram Cup set for race six. First post on the 11-race card is 1PM.